On June 18, 1967, in the spirit of Vatican II, Pope Paul VI restored the order of deacon as a permanent ministry in the Church. In August 1968, the American bishops obtained permission to restore this ministry in the United States. 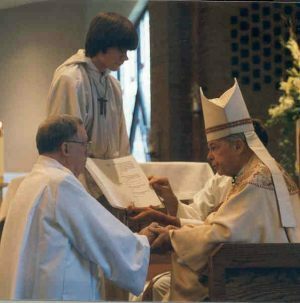 In 2002, Bishop Patrick R. Cooney began a deacon formation program in the Diocese of Gaylord. A deacon is an ordained minister of the Catholic Church. By his ordination, the deacon is called publicly and committed to service in the name of Jesus Christ in the Church and in the world. The document Permanent Deacons in the U.S.: Guidelines on Their Formation and Ministry lists the guidelines of the National Conference of Catholic Bishops. It clearly states that "deacons are ordained by the local bishop for the service of the diocesan church...a deacon is to be committed to a broad range of the diocese's needs and concerns" (#30-32). The applicant must be between 35 and 60 years of age to begin. He must be recommended by the pastor of his parish and must have been involved in parish ministry. If married, the applicant must have been married for at least five years and be in a stable marriage. If divorced, he must have applied for and received a declaration of nullity. The applicant should be physically and emotionally healthy and free of any substance dependency. Deacons must be economically stable and financially self-sufficient. It is expected that diaconal responsibilities will be in addition to their secular occupations. If the applicant was not raised Catholic, five years must have elapsed since his baptism or full reception into the Catholic Church. Graduation from high school or the equivalent is required. Applicants are expected to complete the necessary studies required during the formation period and show a willingness to make a commitment to all aspects of the formation program. The wife of a deacon candidate must demonstrate her support and affirmation of her husband's decision and be willing to participate in those programs and activities where the participation of candidates' wives is required. h. a sense of God's call to serve the Church in the role of deacon. Applicants from minority communities are encouraged to apply. The key characteristics of diaconal formation are: (1) a unified and sound theological education, (2) a pastoral focus and orientation, and (3) a formation in Catholic spirituality which integrates theology and pastoral ministry in the preparation program. For further information, contact the diocese at 989.732.5147.